Wash and dry the tindas and Slice off both ends and peel off the skin. Slit each tinda into four without separating the pieces, ready for filling the masala. Mix half teaspoon turmeric powder, three tea spoon coriander powder, half teaspoon red chilli powder , amchoor / mango powder , ginger powder, fennel seeds powder, fenugreek seed powder and salt mix all these dry ingredients and stuff the slit tindas with this mixture. Heat oil in a pressure cooker. Add the cumin seeds and when they start spluttering, add the onion and ginger, garlic paste and sauté for three- four minutes on medium heat. Add the tomatoes and sauté till they become soft and pulpy. Add the remaining 1/4 tea spoon turmeric powder, one teaspoon coriander powder to the onion, tomato masala and stir intermittently. If the mixture is too dry put a 1/4 cup of water and sauté for a few minutes. Add the stuffed tindas and add half cup of water, close the cooker with the lid and cook till the pressure is formed. Switch off the stove, cool the pressure cooker to room temperature. Open the lid , garnish with fresh coriander leaves. Serve hot with any Indian bread of your choice! 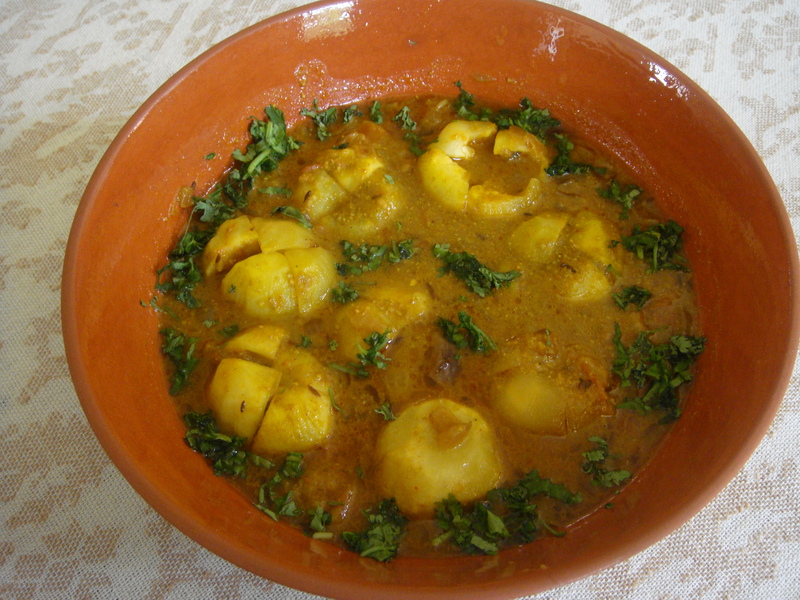 Health benefits of Tinda (Round Gourd): Tinda is famous vegetable in India and Pakistan and regarded as super food due to its numerous health benefits. It contains antioxidants like carotenoids and many anti-inflammatory agents, which are effective for controlling blood pressure, heart diseases, and strokes and prevent cancer formation. It is very mild and soothing vegetable for intestinal tract. A lot of fiber helps in digestion, helps in diarrhea by increased water absorption, relieves stomach acidity, and prevents constipation. Some researches indicate that they are good food for healthy skin and hairs, its consumption result in very long and healthy hairs. It increases the urinary flow and excretes toxins from the kidney. Carotenes present in pumpkins slow the aging process and prevent age related changes in body like cataract formation, grey hairs, thickening of blood vessels bone degeneration, and age related brain cell degeneration. Over all this vegetable, have magical effects on body if used regularly.